The Princess Royal, The Duke of Kent and Prince Michael of Kent attend events commemorating the centenary of the Battle of Jutland, the biggest naval engagement of the First World War. The Battle of Jutland was fought near the coast of Denmark on 31 May and 1 June 1916 and involved about 250 ships. It saw the Royal Navy's Grand Fleet, based at Scapa Flow in Orkney, clash with the German High Seas Fleet. Members of the Royal Family attended events across Europe marking the 100th anniversary of the biggest naval engagement of the First World War. The Princess Royal attended a service at St Magnus Cathedral in Orkney, which paid tribute to the 8,648 sailors who died during the Battle of Jutland. Her Royal Highness laid a wreath outside the Cathedral during a service. The Princess then joined German President Joachim Gauck, Vice Admiral Sir Timothy Laurence and Admiral Sir Philip Jones to lay a wreath during a service at Lyness Cemetery on the island of Hoy. 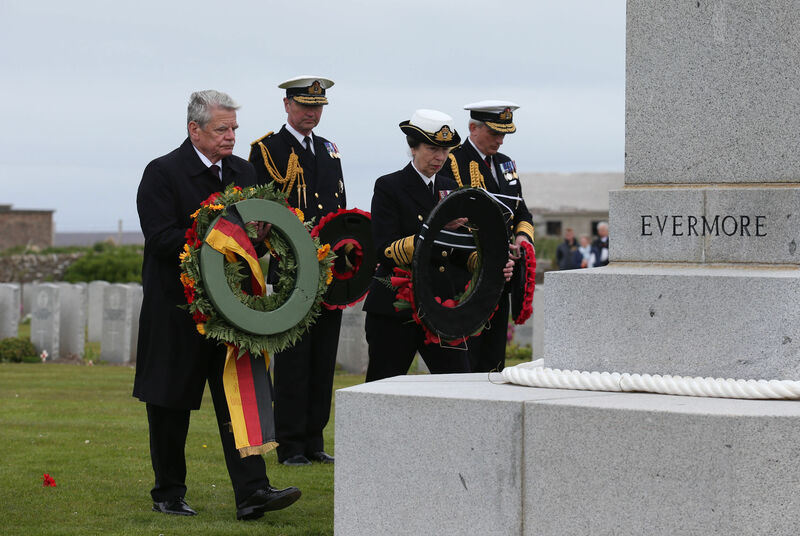 The Duke of Kent spoke at an International Memorial Service at Laboe Naval Memorial in Germany, which remembered victims of the battle at sea.